Summer Programs and Other Opportunities! The Regional Leadership Development Conference is held annually and its primary goal is to equip aspiring chapter leaders with the necessary skills and knowledge needed to have a successful school year. RLDC strives to develop members in areas such as understanding the SHPE infrastructure, personal development, leadership development, and career development. We were very lucky to be able to sponsor 40 people to attend this past conference, and count on your support to enable us to continue achieving this standard. All in all, our members will leave RLDC ready to effectively manage their respective chapters, while possessing the core principals of SHPE. The SHPE National Conference is a flagship networking conference that brings in over 5,000 engineering students, professionals, and corporate representatives together. Our National Conference is designed to provide our members with workshops that help them develop both personally and professionally. Year after year, our members have the opportunity to develop both professional and personal relationships with representatives from the world’s top companies which later turn into full-time, internship, or Co-op job offers. This is where the culmination of all our member’s hard work and all the opportunities we provide pay off. For example, at the National Conference held in Seattle, we sponsored 36 members to attend. The members that attended secured a total of 46 interviews with 28 companies—some of which went on to become internship and full time offers. This is significant because it validates and materializes the promises that we make to incoming members. Our outreach chair is the epitome of our mission to give back. We work tirelessly to provide STEM awareness to underprivileged and underrepresented people. For example, Noches de Ciencias was an amazing success this year. There were 121 attendees (98 students, 61 volunteers, 22 parents). 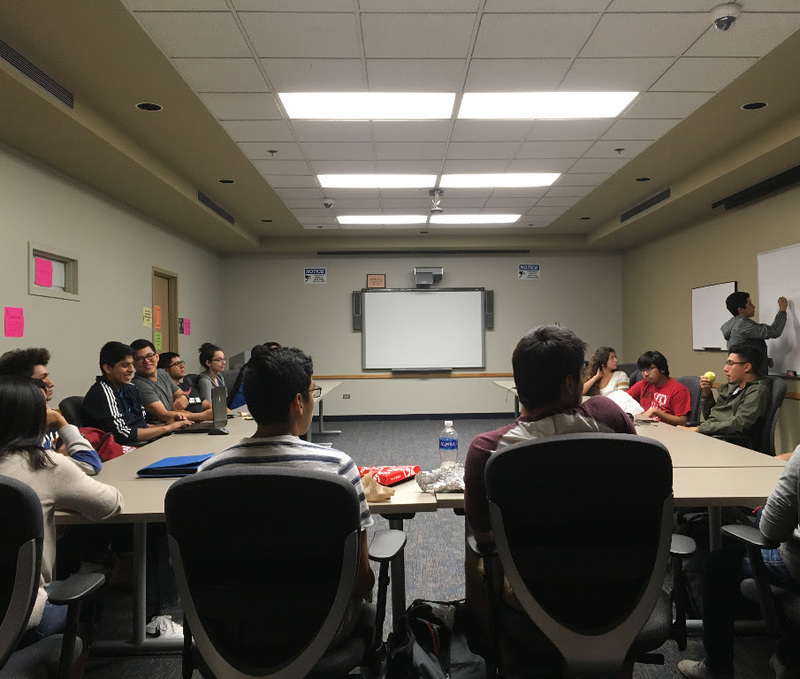 The event included activities for the kids, workshops for the parents, and extensive collaboration/coordination with other SHPE chapters from neighboring universities such as IIT, DALEY, NIU, Northwestern University. The high schools involved were Farragut Career Academy, Benito Juarez, Eerie Elementary, Evanston Township, Chicago Military Academy, Hubbard, and IHSCA. It should be noted that SHPE- UIC took the lead role in coordinating this event. This event, and many more like it, can attest to our commitment to give back. SHPE Jr coordinates STEM related activities for high school students in Chicago aiming to retain their membership the attending the college of their choice. To run an effective program, we need to plan interesting and fruitful activities for the students. From surveying graduating senior members we found that there was a want for more field trips and hands-on activities related to engineering, which will require funding. SHPE Jr meetings take place at the end of the day for students. We are one of few chapters in the nation to have established two SHPE-Jr chapters (one at Benito Juarez High School and one at Whitney M. Young Magnet High). The goal of the MentorSHPE program is to help incoming students transition into the university environment. The new mentees are paired with experienced student mentors, who provide them with advice and motivation during their studies. This is a great way for new students to meet equally dedicated and like-minded individuals. With additional sponsorship, the participants can be provided with enriching activities outside of the classroom. These can include professional workshops, academic tutorials, team building exercises, social gatherings, and end-of-semester festivities. With your support, MentorSHPE can recruit dedicated students to be future leaders in both our SHPE chapter and in the STEM field. Every year, SHPE awards several scholarships to UIC students and the SHPE Jr. chapters. This year, SHPE-UIC awarded five scholarships totalling $1750! Two undergraduates were awarded $500 each while a graduate and two SHPE Jr students were awarded $250 each. We would love to continue awarding our members for their resolve to go above and beyond. The SHPE-UIC RED team is composed of determined members that strive to prove theirabilities on an annual basis at the annual Midwestern Robotics Design competition. Every year these enthusiastic members face a fresh challenge they must overcome. These obstacles and sense of competition give rise to an environment that acts as a catalyst for innovation, determination, and teamwork. More importantly, it allows for students to finally translate theory and words into application and moving parts! In recent endeavors the RED team has always at least reached the semi-finals. The LeaderSHPE Committee was created with the goal of getting new and current SHPE members more involved within the society. Through the LeaderSHPE program, members are made responsible for many of the more smaller public events that SHPE hosts. From fundraisers to community service, members are given the chance to develop leadership skills as well as becoming more familiar with other members in the society, and the SHPE board itself. The structure of the program allows students to get a chance voice their own opinions of how the chapter could be improved, with the added guidance of current board members. Many of the past members of the LeaderSHPE program have become some of the most active members in the society, to the point of joining the current SHPE board. In a nutshell, LeaderSHPE gives aspiring leaders the chance to get a head start, and contribute to the society as early as their first few weeks in their college career. SHPE Activities gives new and current members an opportunity to socialize with others and become active within the society. One of the things that the SHPE Activities does is it allows members can participate in intramural sports such as soccer and volleyball. Members will be physically active, compete with other teams, and blow off some steam during the tense semesters. Another activity we do is the BBQ events, taking place during the Fall and Spring semester. At the BBQ, members can come and treat themselves to a delicious food and relax with others, getting to know others and the board as well. So come and join SHPE with a chance to play a sport and get to know others who may become your close companions in this college journey!